Researchers have discovered how tectonic plates first collided in one of the world’s largest deep sea trenches. One of the biggest questions yet to be answered about plate tectonics is how do subduction zones start? A subduction zone is a deep trough cut across the ocean floor. They form when two tectonic plates collide and one of the plates is pushed under another as they move towards each other, creating an ocean trench. When the tectonic plates collide the underlying plate is consumed into the Earth’s mantle, creating a hot magma that erupts from volcanoes on the surface of the overlying plate. These volcanoes form a volcanic arc. There are examples of this kind of natural occurrence all across the globe. One is the Izu-Bonin-Mariana Arc (IBM), an extinct arc bordering a trench zone south of Japan. 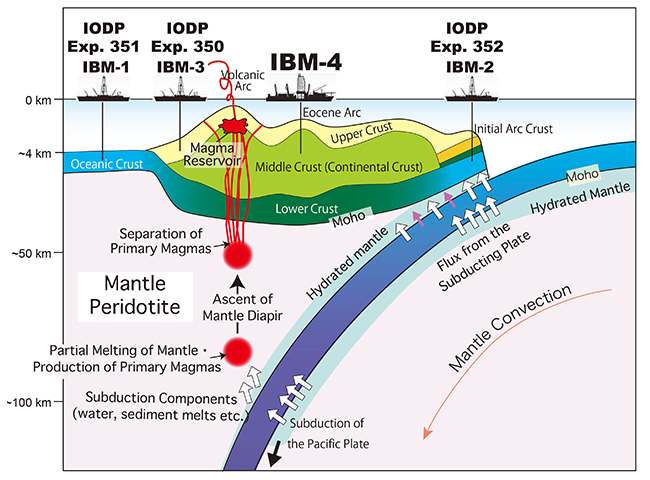 In a new paper published in Nature Geoscience, a team of 30 scientists from across the globe travelled to the Philippine Sea during the summer of 2014 on a large drillship called the JOIDES Resolution operated by the International Ocean Discovery Programme, to drill into the crust of the IBM arc and to try to find out what had caused the plates to collide. Dr Sev Kender a Research Fellow in the School of Geography at The University of Nottingham, was one of the team of 30 who went out on the trip. There are two leading models that exist to explain how subduction zones may start – ‘spontaneous’, where one side sinks because it is more dense, and ‘induced’ where the plates are forced together by pressure from other distant locations. These ideas are not easy to test, because the process cannot be observed happening today. Subduction zones are created over many millions of years, and the initiation period happened millions of years ago in most cases. One way to understand the process is when scientists drill a long borehole into the ocean crust on the overlying plate, to test the make-up and age of the crust and to see how it behaved before the subduction started. The problem with this method however, is that in the millions of years since the initiation, a large amount of sediment has piled up on top of the crust, obscuring it. Dr Kender: “During our expedition to the IBM Arc, we successfully collected 1.5km of borehole through the overlying sediments and into the crust itself, dating the rocks with microscopic fossils and magnetic field reversals that took place throughout Earth’s history. Mid-ocean ridges, which are found in all ocean basins, are where fresh new oceanic crust is formed and are the opposite of subduction zones. There are numerous ‘transform faults’ near ridges today, enormous fractures through the crust that form due to the spreading plates interaction with the curvature of the earth. To view a full copy of the report, visit the Nature GeoScience website.